Dr. Weis earned his medical degree at the University of Minnesota graduating with AOA honors (Alpha Omega Alpha). He completed his residency at the University of Utah where he was chief resident. Dr. Weis has been performing LASIK since 1999 and cataract surgery since 1997. He joined Dr. Roger D. Berglund's practice in 2000 at Northern Refractive Surgery Center. 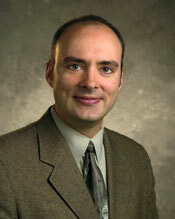 Dr. Berglund was the leading refractive surgeon in Northeastern Minnesota. When Dr. Berglund retired in 2007, Dr. Weis took over the refractive practice in Duluth. Dr. Chris Buntrock was also affiliated with the practice for one year. When he moved on, Dr. Weis then took over his Duluth based refractive patients as well. In October 2010, Dr. Weis incorporated his new company, Weis Eye Center, P.A. as a center for excellence in Refractive and Cataract surgery. He is committed to bringing world class surgical services to Northeastern Minnesota.